In the plugin manager, I have the list of plugins sorted by name by default. the plugins are in random order, although the "Name" column header has the little down arrow next to it. I have to click on the header once, to make it work, and then it continues to work till I come back the next day or so. Try it, test it, and file a pull request! 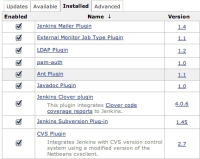 Jesse Glick added a comment - 2013-03-04 23:06 Would probably suffice for PluginManager.getPlugins() to do something like List<PluginWrapper> r = new ArrayList<PluginWrapper>(plugins); Collections.sort(r); return r; Try it, test it, and file a pull request! I don't know, this somehow feels wrong. Why would the getter know anything about the sort order of the presentation? Why should it sort by name and in what direction? This should be handled by the same class that does the sorting in all other cases. It is already displaying that little arrow to indicate that the list is sorted, it is also that class' responsibility to actually sort the list. Marc Günther added a comment - 2013-04-03 19:03 I don't know, this somehow feels wrong. Why would the getter know anything about the sort order of the presentation? Why should it sort by name and in what direction? This should be handled by the same class that does the sorting in all other cases. It is already displaying that little arrow to indicate that the list is sorted, it is also that class' responsibility to actually sort the list.